Russian scholar; born at Wilna Sept., 1819; died there Jan. 11, 1891. He received the usual Talmudic education, and also acquired an extensive general knowledge of the profane sciences. In 1848 the government appointed him professor of Hebrew and Jewish history in the newly founded rabbinical school of Wilna. Fuenn filled this position with great distinction till 1856, when he resigned. The government then appointed him superintendent of the Jewish public schools in the district of Wilna, in which he introduced instruction in the secular sciences and modern languages. Fuenn also took an active part in the administration of the city and in its charitable institutions, and was for many years an alderman. In acknowledgment of his services the government awarded him two medals. Fuenn was a prolific writer, devoting his activity mainly to the fields of history and literature. He published the following works: "Imre Shefer," two lectures (one delivered by the author; the other translated from the German), Wilna, 1841; (with L. Hurwitz) "Pirḥe Ẓafon," a review of history, literature, and exegesis, 2 vols., ib. 1841-44; "Shenot Dor we-Dor," a chronology of Biblical history, Königsberg, 1847; "Nidḥe Yisrael," a history of the Jews and Jewish literature from the destruction of the Temple to 1170, Wilna, 1850; "Ḳiryah Ne'emanah," a history of the Jews of Wilna, ib. 1860; "Dibre ha-Yamim li-Bene Yisrael," a history of the Jews and their literature, in two volumes (the first dealing with the period extending from the banishment of Jehoiachin to the death of Alexander the Great; the second from Alexander's death to the installation of Simon Maccabeus as high priest and prince), ib. 1871-77; "Sofre Yisrael," selected letters of Hebrew stylists from Ḥasdai ibn Shaprut (915-970) to modern times, ib. 1871; "Bustanai," a narrative of the time of the Geonim, translated from the German, ib. 1872; "Ma'amar 'al ha-Hashgaḥah," a Hebrew translation of Moses Mendelssohn's "Die Sache Gottes," ib. 1872; "Ha-Ḥilluf," a Hebrew adaptation of Lehmann's "Graf und Jude," ib. 1873; "Ḥuḳḳe 'Abodat ha-Ẓaba," Russian laws relating to the conscription, ib. 1874; "Ya'aḳob Tirado," a Hebrew translation of a German novel by Philippson, ib. 1874; "Ha-Tefillin," a Hungarian village tale translated from the German into Hebrew, ib. 1874; "Le-Toledot R. Sa'adyah Gaon," materials for the biography of Saadia, published in "Ha-Karmel" (vol. ii., 1871); "Ḥakme Yisrael bi-Krim we-Gedole Yisrael be-Ṭurḳiya," biographies of Jewish scholars in the Crimea and in Turkey in the fourteenth and fifteenth centuries, published in "Ha-Karmel" (1861); "Safah le-Ne'emanim," an essay on the value and significance of the Hebrew language and literature in the development of culture among the Russian Jews, Wilna, 1881; "Ha-Yerushshah," Hebrew adaptation of Honigmann's "Die Erbschaft," ib. 1884; "Ha-Oẓar," a Hebrew and Chaldaic dictionary giving Russian and German equivalents for the words of the Bible, Mishnah, and Midrashim, vol. i. (from א to ו), Warsaw, 1884; "Keneset Yisrael," biographical lexicon of Jewish scholars and other prominent men arranged in alphabetical order, vol. i. (from א to ו), ib. 1886-90. 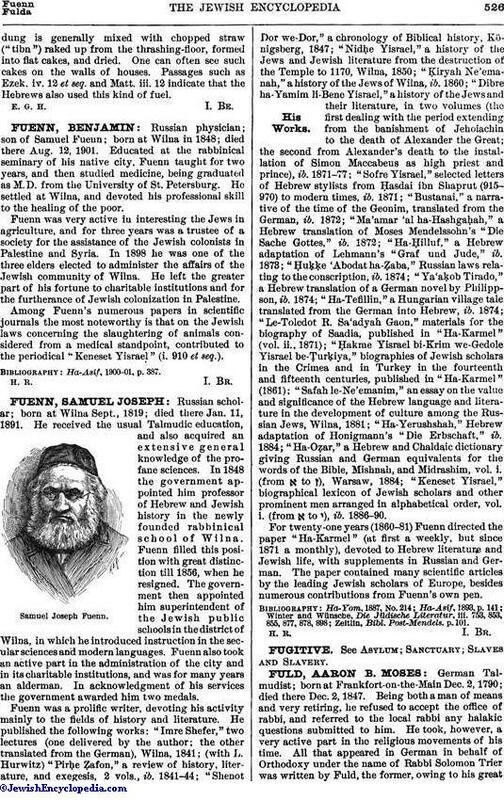 For twenty-one years (1860-81) Fuenn directed the paper "Ha-Karmel" (at first a weekly, but since 1871 a monthly), devoted to Hebrew literature and Jewish life, with supplements in Russian and German. The paper contained many scientific articles by the leading Jewish scholars of Europe, besides numerous contributions from Fuenn's own pen. Zeitlin, Bibl. Post-Mendels. p. 101.